It is never an easy task following up a debut album that delivered one of South Africa’s most enduring and endearing hits. Nor it is easy to record a full album when you’ve already laid down a bunch of songs only to discover they were never properly captured by the studio gadgets you relied on. Such has been the case for Blk Sonshine, the duo that captured the hearts of South African music fans a decade ago with Born In A Taxi, the smash hit off their 2000 “Blk Sonshine” debut album – and who were back in the recording studio five years ago working on a new album that did not manifest, following a studio mishap. He’s right – and thankfully, the unhurried approach to recording “Good Life” has resulted in an album of sweeping beauty that contains all Blk Sonshine’s signature sounds that fans fell in love with on the band’s debut (warm, acoustic melodies juxtaposed against intelligent lyrics and the interplay of Muyanga and Chipembere’s vocals) but now significantly dialed up to a different time. The latter comes courtesy of some stunning new elements that add a delicate but potent layer of sound to Blk Sonshine’s music. Gorgeous strings abound, and players like Famoro Dioubate, a balafon player known for his work with Mory Kante, add a dreamy quality to tracks. There is also a sense of expansiveness in the music: whereas Born In A Taxi was so quintessentially South African (and perfect for the time in 2000), the set of 11 songs on “Good Life” draw from a head-spinning array of places from Addis Ababa to the Indian sub-continent and beyond. To hear how masterfully this all comes together, hit play on a song like Gliding. Exquisite in its simplicity, the song is transporting and displays how effortlessly Chipembere and Muyanga are able to conjure up musical magic jointly. It is the same with the piano-inflected Step It Up which again makes use of Muyanga’s ability to deliver the high notes in a way that the listener will shudder with emotion. But as effortlessly as the duo is able to strip their songs to the bare minimum of beauty, so Blk Sonshine is able to inject an enviable jaunt into their material; the kind of upbeat, kinetic sound that ensured Born In A Taxi would become a big hit. A great example of this is the first song on the album and the title inspiration – Good Life. The song has all the makings of a live favourite and is full of enough bounce and beat to make it memorable – especially when combined with lyrics that are, in typical Blk Sonshine style, astute and on-the-mark. Watch This Woman is equally as intoxicating – a track that links South Africa’s traditional music roots, like everything Blk Sonshine does, with some startling insight on gender activism that is fundamental to contemporary African society. What’s most striking about “Good Life” is its diversity of material. Nkosi is a liltingly beautiful Gospel number that features the gifted Xhosa vocalist, MXO and the equally talented hip-hop artist Tumi. Testify, with the violin heavy in the mix, presents yet another face of this vastly talented duo. “Of my own songs, I would say Gliding because it is an extension of the ideals in Soul Smile which was my favorite song in the first album,” confides Chipembere. “I really love Neo’s song Good Life too. I find it thick with metaphor. It also has something childlike and innocent about it. Yet at the same time, any hip-hop head can hear that he is styling out in the verses. He is basically rapping with a melody. Tight!” For Muyanga, the choice is much harder. “I really like all of them. I tend not to have favourites,” he says simply. It is hard not to make comparisons to “Blk Sonshine” and specifically Born In A Taxi – but this is not something that bothers the duo. “The idea is never to write for an audience, but to communicate a feeling or to reflect on a quest(ion),” Muyanga explains. There’s no doubt that both Muyanga and Chipembere’s desires are reflected on a record – that was, it’s important to say, recorded between New York (Chipembere’s home), Cape Town (where Muyanga resides), Los Angeles and Johannesburg, drawing on a cast of players who contribute to the world class sheen that’s evident on each song. It’s also clear that their individual visions were easily converted from the songwriting process, to the recording, to the final album. Modern yet ancestral. Personal yet striking. Positive. Thoughtful. Resplendent. Intoxicating. 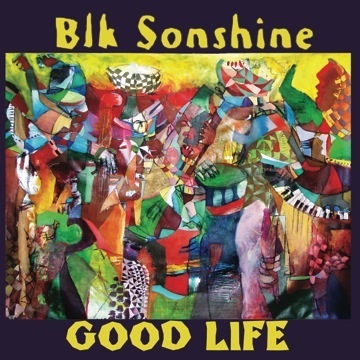 “Good Life” is a gift which proves that Blk Sonshine is stronger than ever, blessing your heart and healing your soul.